Move over tooth fairies! There’s a new kind of pixie about and it is taking the world by storm. If you love books and you haven’t lived under a rock for the past year or so, you might have heard about The Book Fairies, a worldwide network of book lovers who leave free books in public for other people to find. 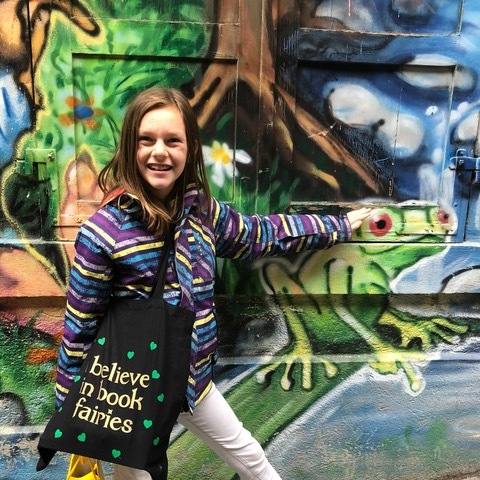 Started in the UK in March 2017 by Chief Book Fairy Cordelia—who hoped to help preserve and foster the love of books and reading— the network today numbers some 9,000 fairies in over 100 countries. The Woolf’s Susan Platt met up with one of the youngest fairies of the flock, 10-year-old Eleanor Gooding. She is Switzerland’s first official Book Fairy and also on the hunt for new recruits. We sat down with the energetic book-lover for a slice of pizza and a chat among, well, book fairies. Thank you so much for meeting up with The Woolf today. Tell us a little bit about yourself and how you first learned about the Book Fairies. What did it take to become one? I am actually called Eleanor but I like to be called Ellie. I am 10 years old. I am originally from England but I live here in Switzerland and I’ve lived here for 6 years. I follow this girl Chloe on Instagram and she also loves books. One day I noticed she started doing the Book Fairies and I thought it was a cool thing to do. So I asked my mum to help me become a Book Fairy and she looked them up on the internet and ordered me the bag and a bunch of Book Fairy stickers. And that’s how I started. I’ve been doing it for about three months now. I absolutely love it. What kind of books do you hide? [With a cheeky grin] Big ones, small ones! Some as big as your head. [Giggles.] Mostly kids’ books in English. But also some in German. What’s the next question? What are your favourite kind of books? Nothing too girly, ewww. Anything that has adventure in it. Funny books! I love funny books. I love David Walliams and Roald Dahl. What are some of your favourite hiding places? I love hiding books in the mountains. Then the books get a nice view. And it’s also pretty for the person to find it. It looks super cool when there is snow. But then of course you must make sure the book stays dry. You need to be careful when you hide books, you know? Do you only hide books in Switzerland? No, no! I take them with me when we travel so I hide them all around the world. Just last week I hid one when I was on holiday in Crete. But I also made some book drops in England and Germany so far. Have you ever heard back from people who have found your books? I can’t believe I have so many followers already. Most of them comment and say how much they love what I do and that it is so cool. They send me nice messages and green hearts because the book fairy colour is green. I have made some new friends from the Book Fairy posts: Chloe, who was my inspiration to become one, and the Chief Book Fairy, Cordelia, and neeeeeearly David Walliams! Nearly! What are some of the reactions you’ve had on Instagram from your posts? Did you ever hear from any of the authors whose book you hide? Yes, David Walliams liked and commented on one of my posts. That was very exciting! I’ve also met local author Liam Klenk because of the Book Fairy Independent Author Day. Meeting him was very cool. We got on immediately. We’re friends now! I was also in touch with Lawrence Prestige. He sent me some books. What’s the best part of being a Book Fairy? Hiding books makes me feel good. I like the idea of someone finding the book and then finding out about what’s inside. Have you ever found a book by another Book Fairy? Not so far! But I really want to. I hope there will be more Book Fairies in Switzerland so I can also find some books! What is your greatest wish as a Book Fairy? I would love to go and hide books together with David Walliams. If he’s up for it! And finally, The Woolf special question: What is one of your favourite works of fiction and why? Well, anything by David Walliams. Because all his books are silly and funny and weird. And I have a silly sense of humour.